Paramount has confirmed that Tom Cruise will fly in "certain aircrafts," not fighter jets in Top Gun 2. Additionally, the studio also revealed that filming has not been halted in order for the actor to learn how to fly a fighter jet. Cruise is known for doing his own stunts, which has included flying a helicopter in Mission: Impossible - Fallout, but he is stepping up his game for the Top Gun sequel. Let's just hope he doesn't break any bones this time. Last week, it was reported that Tom Cruise had shut down the production of Top Gun 2 in order to learn how to fly fighter jets. However, the sequel will continue to film through the spring of 2019, according to sources at Paramount. As for the flying of fighter jets, that isn't true. But, Cruise will be flying some other types of aircraft that have yet to be revealed at this time. The actor already has his pilot's license, so that will more than likely end up being utilized at some point in the sequel. As it turns out, civilians are not allowed to pilot government-owned fighter jets. 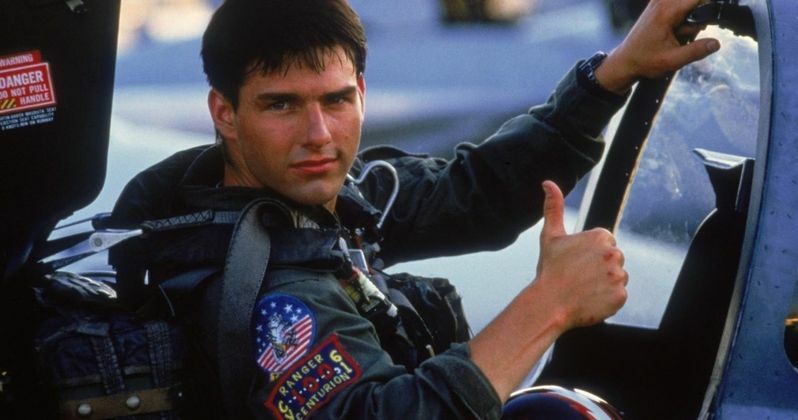 Top Gun 2 isn't going to break United States military laws, which is kind of a bummer, but it has been confirmed that Tom Cruise's Maverick will really take on some of the flying duties for the sequel. It's going to be interesting to see which of these "certain aircrafts" that the actor will be featured in when the movie arrives in theaters. For now, we're just going to have to wait until the movie opens in 2020. Top Gun 2 takes place over 30 years after the original movie, and sees Tom Cruise and Val Kilmer back to their iconic roles as Maverick and Iceman, respectively. In addition to the return of Kilmer and Cruise, the sequel boasts an impressive list of actors including, Jennifer Connelly, Jon Hamm, Ed Harris, and Miles Teller. Connelly is playing the female lead in the movie, and pictures from the set recently leaked online, featuring the actress riding on the back of a motorcycle with Cruise, reenacting a classic scene from the original movie. Top Gun 2 was originally set to fly into theaters in the summer of 2019, but it has since gotten pushed back to June 26th, 2020. However, the sequel was not pushed back to allow Tom Cruise some extra time to learn how to dogfight in an F/A-18 Hornet. Instead, the filmmakers need the extra time to get up to date with all of the current military weapons to get some realism included in the project. A year seems a bit excessive, but it appears that it's necessary in this particular case. Entertainment Weekly was the first to announce that Tom Cruise will fly in Top Gun 2, but not in the fighter jets that we were hoping for.